This is all of the characters to scale with each other. They look pretty cool, eh? The cape is transparent here for purposes of clarity. 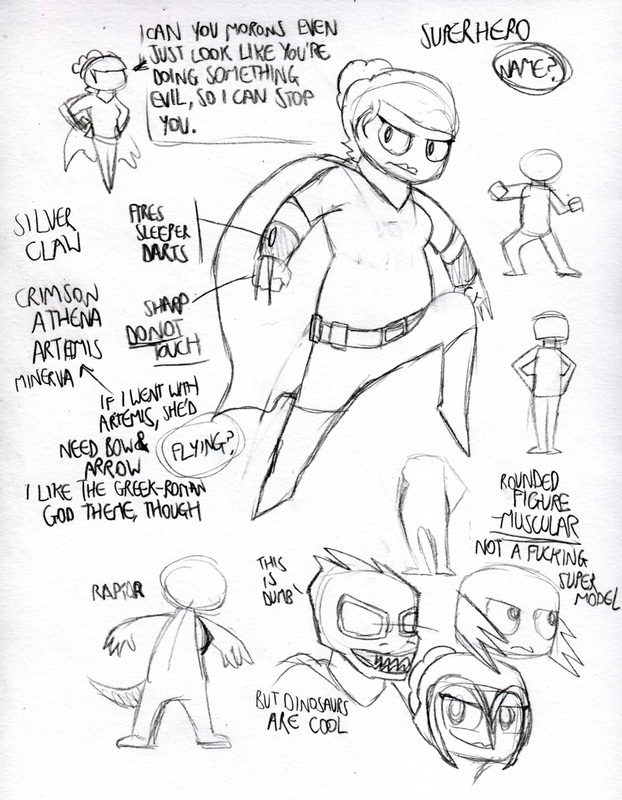 So yeh, here's the superhero turnaround. Quite a muscular-build, sort've inspired by how goddamn hench male superheroes tend to be. For example. The only thing that annoys me is that the legs seem too thick on the side view. It'd probably be fine in motion and stuff, but yeh. Slightly annoys me that I can't work out how to make the legs look right on that one without making her look fat rather than muscular. I'll admit, this feels a little daft, given that the Ghost is 70% amorphous gas cloud, but hey, looks good on a blog, doesn't it. I was trying to work out the best way to indicate the back of the mask, and I settled on deciding to darken it, which makes sense, seeing as how the core column of ghost-stuff is between the mask and the viewer. Did some swatch tests for my superhero's colour scheme. The far-left image is a blank one, where I've labelled parts that would be directly influenced by specific parts of an owl's colour scheme. The three owls I've chosen to try and pick a colour scheme from are the Snowy Owl, the Eurasian Eagle Owl and the Great Grey Owl. I quite like the colours of the Snowy Owl, but I wonder if it seems to villian-y. I think it's mainly between Snowy and Great Grey at this point. I'll probably see what colours I chose for Grab, because if the villains are all colourful, then it sort've makes sense for the hero to be contrasting to that, so as to appear opposite to them. I still need to pick a superhero name for her. Could depend on what owl I chose. I've been doodling the superhero character. Personality-wise, she's usually got the attitude of a frustrated customer-service-industry-employee when fighting the villains, as she just wants to beat them dramatically so she can get promoted to a high rank of hero. Design-wise, I'm going with a sort of owl theme, taking inspiration from the idea of Athena - the Greek goddess of war and wisdom. 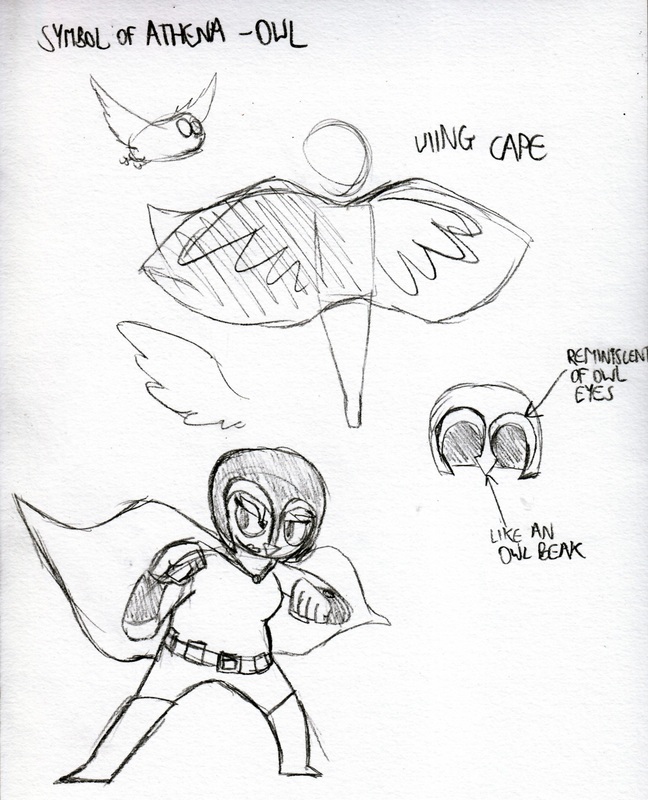 So the cape's going to be reminiscent of owl wings, and the helmet is inspired by the shape of the eyes and beak of an owl. With gadgets and stuff, I'm equipping her with some wrist blades - going with the owl theme, this is meant to be comparable to the owls claws. And she's also got shootable sleeper darts, just cos she really ought to have some sort of range weapon, and it being non-lethal means that I can actually shoot main characters with it during an animation. Did some doodles, trying to work out how I want the ghost character to operate. I think there's likely to be a core cloud that hangs directly from the mask, and an outer aura that allows it to interact with objects and people. Personality-wise, I think sort of a sarcastic dead-pan kind of character, like some sort of mix between GLaDos and Jack Dee. I have an idea on how to achieve an aura effect in Flash similar to that which is in the coloured/shaded doodle in the middle there, but it'd be filter-heavy and so would be rather cpu-intensive, and may well lead to Flash crashing when trying to animate it. But hey, it's worth a shot and might look cool, so I'll probably doodle up something in Flash to give it a shot. Got some turnarounds done for Grabble. Also, I'm fairly certain I'm gonna change his name to Grab. Smash and Grab sounds like a good combo, name-wise. Just need to work out his colours now. Ok, so I did a turnaround for Smash. It came out looking pretty good too. Think I've got him worked out from most angles now. One thing that I think I'm going to make sure with all of these characters is that they're either entirely or at least mostly symmetrical. With Smash, I probably need to work out what he looks like on the other side just cos of his hair, but that shouldn't be too tricky, and honestly, I'm not sure anyone would notice if it was just a horizontal flip of the images below. I think I'm gonna go with the red and white one. The black/grey one was done with "stealth" in mind, but given the gadgets he's got, that doesn't really fit him too well, and the yellow/white one just didn't seem very villainous. I think it's quite neat how the red one sort've reminds me of the uniforms from Attack on Titan, but also the stereotypical colonial British army uniform. So yeh, I think I'm going with that one. 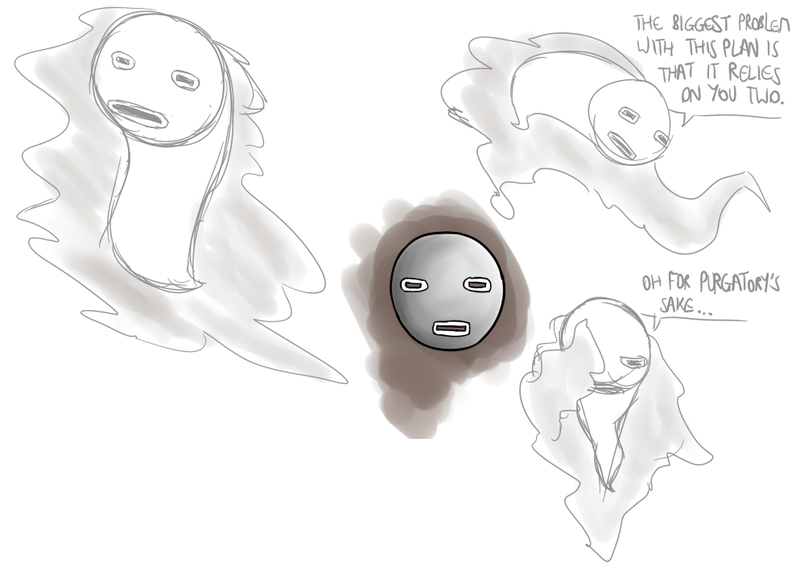 Ok, because I think it'd be more interesting/fun to work with, I'm gonna go with the ghostly character. The clown one was more of a joke - thought it might be funny having this super serious villain with a humorously oppositional mask. It could work as a minor gag within a short featuring these guys, but i don't want it to be their permanent mask. The middle one, I was kinda trying to work with a face that would work as a wooden mask, but would be believably expressive. Give the character a means to really get angry/happy. It'd perhaps help get more of the character across clearer to whoever's watching. The minimalist one was on much more a darker path. A face that you can't read very well is infinitely more unnerving than one where the emotions are written on their face. So a much more serious, sinister path with that one. With this mask, I'd imagine the character with a much deeper voice than with either of the other two masks. This perhaps reduces the possibility for comedy a little bit, but does open some other interesting doors. 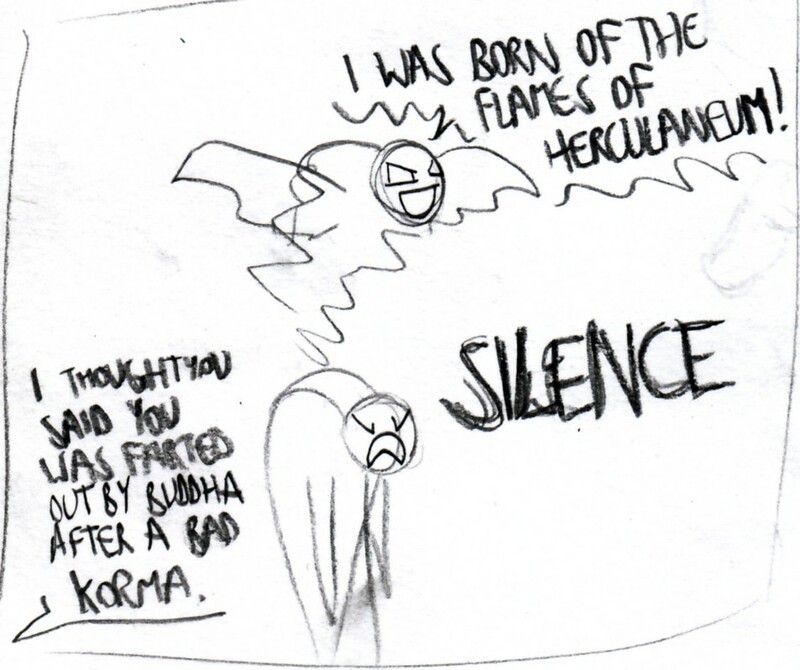 So while I was trying to come up with ideas for the third supervillain, I hit a bit of an inspiration stumbling block. I knew it was going to be a smaller character who floated around, but I can't make my mind up between a ghost/demon character and a robot character. If I went with the robot character, he'd be much more of a supporting comic relief character, and quite possibly to blame for much of the mess-ups with their evil schemes, who they'd turn to in order to work out how evil a given plan was, probability of success, etc. This would probably put Smash in the role of the leader/brains of the group, making him a more serious character. It's a tough call between these two, because I have enough ideas to make both of them work, but the appearance of one would negate the need for the other, so I can't include both. 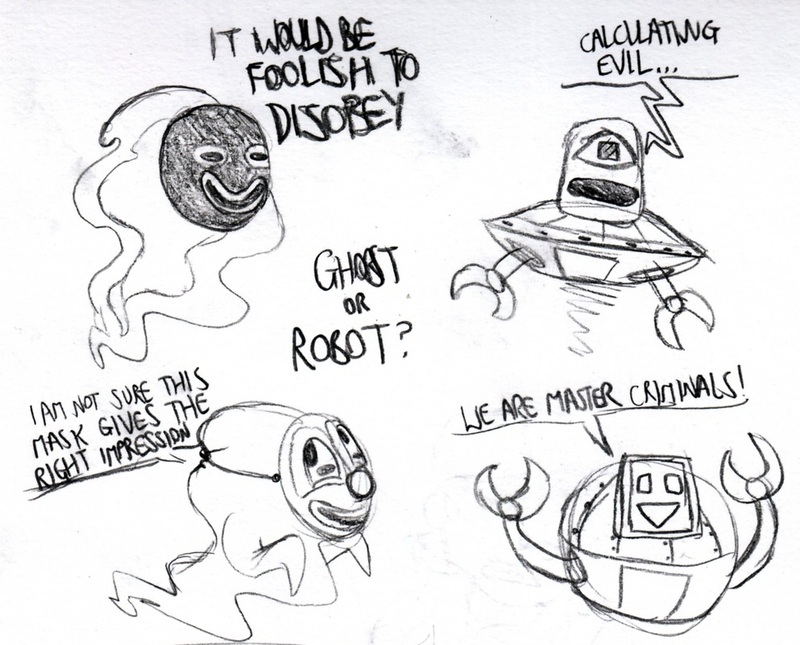 The robot would be in-keeping with the sci-fi elements, but the ghost would add more variety to the group. Might have to flip a coin over this one.